Find out about the year's MBA highlights. It’s been another successful year for students and alumni from Cass MBA programmes. We look back at some of 2016’s top news and events with Dr Sionade Robinson, Associate Dean, MBA Programmes. “The year got off to a flying start in January when we increased our position by eight places in the Financial Times Full Time Global MBA 2016 ranking. Our MBA programmes are now ranked 37th in the world, 13th in Europe and 6th in the UK,” said Dr Robinson. In February, we cracked open the champagne when MBA student George Watson was awarded first prize in the annual BusinessBecause Global MBA Competition for his essay The future of the sharing economy- what else will we be ubering by 2050? We celebrated again in March when we heard that FTMBA alumnus Pearce Watson was awarded the prestigious Lombard Prize by Worshipful Company of International Bankers. Pearce, who is based in New Zealand, won the prize for his submission, What Would Create Sustainable Depth On The ‘Sell Side’ Of The New Zealand Dairy Futures Market? It was time for the London Symposium in April, a flagship MBA elective. The theme for this year’s Symposium was Explorers & Discoveries and it was opened by Sir Alan Yarrow, Chairman of the Chartered Institute for Securities & Investment and former Lord Mayor of the City of London and City University Chancellor. “The Symposium provides our students with networking opportunities and access to some of London's most influential figures across business, finance, media, culture and sport. We mix thought leadership in plenary sessions with a ‘backstage pass’ to some of London’s most iconic locations, brands and organisations which drive the city's prosperity - from the Treasury to the Ministry of Sound; Central St Martin's to Lloyds of London and from Soho to Savile Row,” Dr Robinson said. There was more student success in April when Michael Williamson, a FTMBA student, won the Bloomberg Investment Ideas Challenge 2016, a prestigious competition that involves students picking stocks and sending their investment ideas into the Bloomberg Professional Service trade ideas network. In September, a group of EMBA students were finalists in the Financial Times MBA Challenge. Cass team members Stephanie Wong, Catherine Darlington, Sarah Rench, Anthony Noun, David Aobadia and Brett Anderson joined colleagues from Kellogg Northwestern University and Kellogg HKUST to help Stop the Traffik, a human trafficking monitoring organisation, build a business plan. In October, MBA alumnus Tom Ilube was named Britain’s most influential black person on the Powerlist, the annual list of the 100 most powerful people of African and Caribbean heritage in Britain. 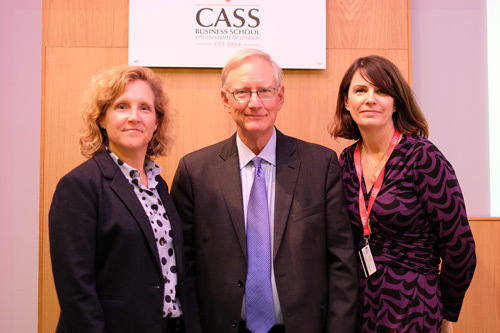 We were also delighted to welcome the renowned business management leader Dr Tom Peters, to Cass in October to give an exclusive MBA masterclass to students. “Dr Peters, co-author of the popular management guide In Search of Excellence, spoke to students about the importance of pursuing excellence in management practice, the importance of a strong business culture and his core belief that joy should be at the centre of the workplace,” said Dr Robinson. In November, we were pleased to announce that MBA alumnus Douglas Markey won the esteemed annual prize from the Worshipful Company of International Bankers for his dissertation How does management’s response to shareholder activism play a role in creating and/or destroying stakeholder value surrounding M&A? “Another November highlight was the news that MBA alumnus Khalid Al-Qaqa received the Forbes Middle East Global Meets Local Top Executive Management Award 2016," said Dr Robinson. “We received more good news in December when it was announced that Mark Sherwin, MBA alumnus and Managing Director for Accenture Interactive, was named number three in Drum's Digerati 2016 – the most influential individuals in the UK's digital landscape. It’s another great achievement for one of our valued alumni community,” said Dr Robinson. Dr Robinson said that while 2016 had been a successful year, 2017 is set to be an equally exciting year. You can find out more about studying for an MBA at Cass here.